The Renaissance period (circa 1430 -1700) saw a dramatic rise in the popularity of the lute. As an introduction to lute music from this fascinating historical period, here’s one of the most famous pieces associated with the instrument – Greensleeves. This is a very simple piece that shouldn’t prove difficult to learn. There are a couple of slightly awkward stretches, but these will come with practice. From the late 15th century through to its decline in the first half of the 18th century, the lute played a very important role in musical life. It was by far the most popular domestic instrument and, although very quiet compared to the modern guitar, fulfilled many diverse roles. It made a versatile solo instrument, could be used as continuo in ensembles and was a popular accompaniment to song. Virtuoso lutenists were highly sought after among the Royal courts of England and Europe – and the nobility would pay highly to employ the likes of John Dowland, Anthony Holborne or Francis Cutting. Much of the surviving lute music exists in collections of tablature. Many of these pieces have been transcribed for playing on the modern classical guitar, where they make a sizeable and important contribution to the instruments’ relatively modest repertoire. Greensleeves is a very well-known tune and is a favourite study piece for beginners. Although the original composer is unknown, it has survived through the centuries in many arrangements by Elizabethan lutenists and keyboard players. There is a romantic suggestion that King Henry VIII – a very capable composer by all accounts – wrote it as a song for Anne Boleyn, but this is impossible to prove with any certainty. Even with a simple piece such as this you should still concentrate on preparing things in advance. In Photo 1, showing the second beat of bar 1, the 1st finger is on the 1st fret of the second string and the 3rd finger is on the 3rd fret of the fifth string. However, the most important fingers shown in this photo are the 2nd and 4th. The 2nd finger should be hovering over the 2nd fret of the first string; quick movement of this finger is required to bring it from the third string where it was used in the previous beat. The finger you’re probably least aware of, as it isn’t actually doing anything at this moment, is the 4th finger. This was used in the previous beat for the D on the 3rd fret of the second string. Try to avoid taking it to far away from the second string when you lift it up to play the 1st fret C on the second beat. Lift your finger just enough to play the C but leave it hovering directly over the D, which is played on the first beat of the next bar. Photo 2 shows something similar: here, as soon as the 1st and 2nd fingers are placed on the third string G# and fourth string E respectively, the 4th finger must be stretched out to hover above the 4th fret of the fourth string in readiness to play the F#. 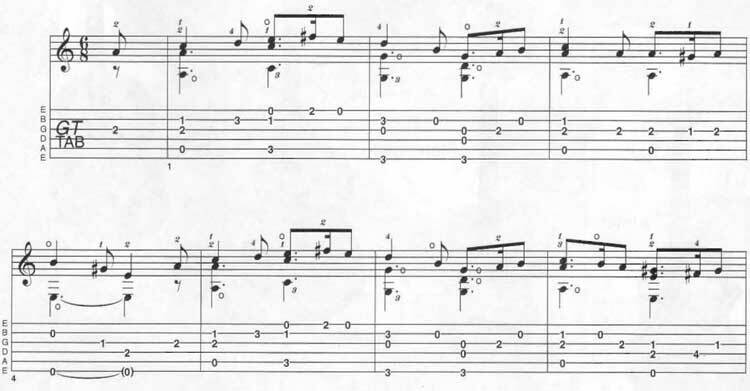 The 3rd photo shows the G major chord played on the first beat of bar 9. 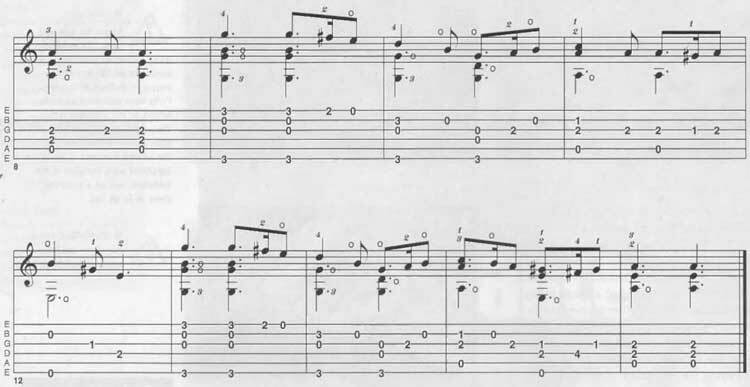 Notice that the 2nd finger is holding down the F# on the 2nd fret of the first string -even though it isn’t played until the second half of the second beat. Basically, this kind of preparation will help you avoid rushing to find notes, making your playing sound much more polished and fluid. © 2012 - 2019 TabsClub Powered by TabsClub 42 queries in 0.349 seconds.